And a God hand, too! So, Blender, 3D modeling. I found a really good tutorial, and am progressing through it pretty decently. It taught me that it’s best to have a wireframe sketch of your model before you actually try to model it. I used his example sketch, but it looks like I’ll need to train myself in the field of sketching the wireframes of low-poly models. That shouldn’t be too hard though, since I’m God-awful at anything that is fluid biological forms, and low-poly is not that. I did, however, get some practice in with drawing today. Someone posted a sunset, telling us he wanted to see ours. Most did a pixel-art sunset, like his was. 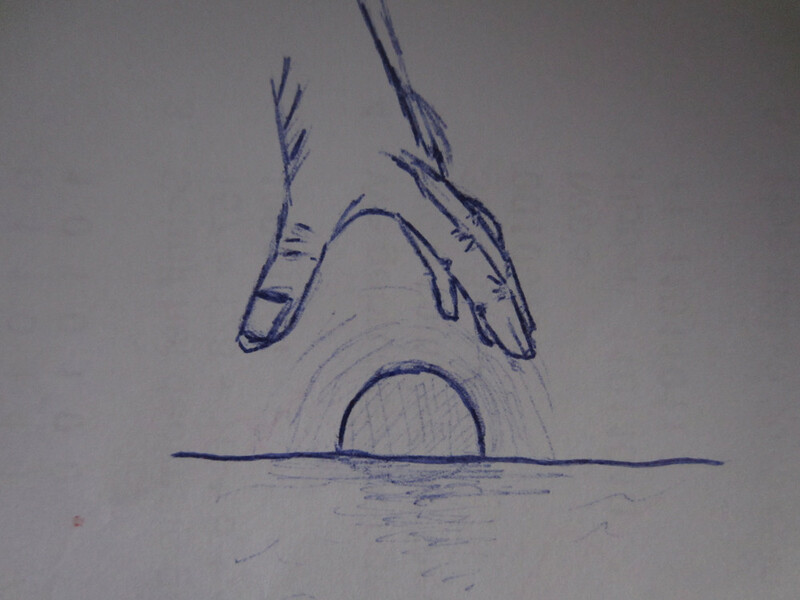 I wasn’t feeling like that, so decided to pick up pen and paper, and roughly draw my own sunrise. The initial idea was to have a monster wrap its mouth around the sun or something, but I ended up going with this. It’s a (God?) hand reaching down, seemingly reaching for the sun. People told me it actually looks sort of decent. I used my own hand as a reference. Or rather, tried my best to draw it accurately. It ended up sort of okay. Fingers extending into the hand and wrist are hard though, damn. Screwed up the thumb as well, but that could’ve been fixed if I had used a pencil instead. What do you think? Did I do well? Oh and it seems the archive page has been broken for a while. Why did nobody tell me? Eh, fixed it, so all’s good now. Those tutorials .. what a great find! That is gorgeous you multi-talented feller you! You drew that? It does look pretty good. It reminds me though of why I’d never be any good at something like that, as I possess no artistic ability.